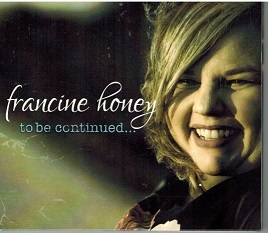 Francine Honey is an Billingual Ontario singer-songwriter and just released her third album entitled, To Be Continued. The album features tales of heartache and hope delivered with a mix of Americana, country-folk, Canadiana and blues. Francine shares two fundamental lessons: You are not alone and hope is always around the corner. Francine is a songwriter since childhood, this former civil servant packs a lifetime of emotion into every song. Her music has taken her across Canada, US, UK, Switzerland and Italy. Marilyn-I Wish-Can't Break Through To You. The CD was recorded at Skinny Elephant Recording in Nashville TN. Francine does a fantastic job singing her own words and Atlantic Seabreeze has nothing but praise for this album and we for see award nominations for this album. The CD deserves a full 5 star rating out of 5 stars. For further information regarding this album and others by Francine, refer to her website, address posted above.